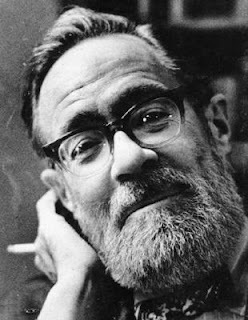 Last night I took myself into the chill and arrived at Lake and Chicago to watch a screening of Carol Johnson's 1974 documentary on John Berryman entitled I Don't Think I Will Sing Anymore Just Now. Before some technical difficulties ended the short film a little too shortly we got to see the facets of Berryman that enthralled and confused his audience--his great reading, his love for teaching, his great battles with the bottle and his ongoing sadness regarding his own father's suicide. Critics, friends and family also chimed in with rememberances and anecdotes. When the dvd player froze Berryman was giving a reading and his hand was pointed to sky with mouth wide-open. Disappointing not to catch the entirety of this rare film--yet somehow right. Before and after the audience was treated to people reading various Dream Songs. The highlight, for me at least, was hearing his widow Kate read one that she said she always loved hearing him read aloud. It was a stunning little moment. I had the thought to drive the Washington Ave. bridge where his life ended in 1972 on a very bitter January day--but it was late and time to just go home. Which Dream Song did Kate like and read? Do you know where I could find this documentary?